On several occasions we have written about La Luz de La Esperanza Palomas Outreach, which was formed in 2004 to assist the community and surrounding areas of Puerto Palomas, Chihuahua, just across the border from Columbus, N.M. The organization is in the midst of a food drive, and I hope you can help. 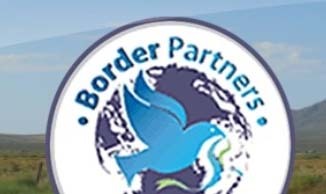 Now, I would like to tell you about a separate effort to support the community in Puerto Palomas, sponsored by an organization called Border Partners, a nonprofit organization that, among other things, promotes and supports the creation of small business opportunities along the New Mexico-Chihuahua border. Helps foster new business development so that people in need can increase their income. Promote the use of low cost, sustainable technologies to make best use of natural resources. By using solar energy, water-saving technologies and home gardens, people can save money and improve their standard of living. One of the businesses that Border Partners is supporting is Palomas Oilcloth Designs, a business developed by seven women from Palomas. The name of the company speaks for itself. The women sew beautiful oilcloth designs in their homes and sell them through Etsy, an organization that provides an online site for people around the world to sell crafts, jewelry, apparel. The women--Ludy, Chayo, Juana, Juliana, Maria, Martha and Socorro--are very professional in their approach, coordinating their designs and participating in other marketing functions. By the way, they are also on Facebook. Our beautiful tote bags and aprons are colorful, durable and waterproof! Each bag we make gives us hope that life will be better! So how can you purchase one of these bags, aprons or other items produced by Palomas Oilcloth Designs? It's easy, Just click on this link, which will lead you to their Etsy online catalog. If you haven't completed your Christmas shopping, this gives you the opportunity to acquire presents and help the community of Palomas. But your purchases should not be confined to Christmas. These products are available year-round for birthday and other special occasions. I love the bags and aprons from Palamos Oilcloth Designs - it's so good to see a mention of them here! Annelisa: Thank you for visiting the blog all the way from the UK!